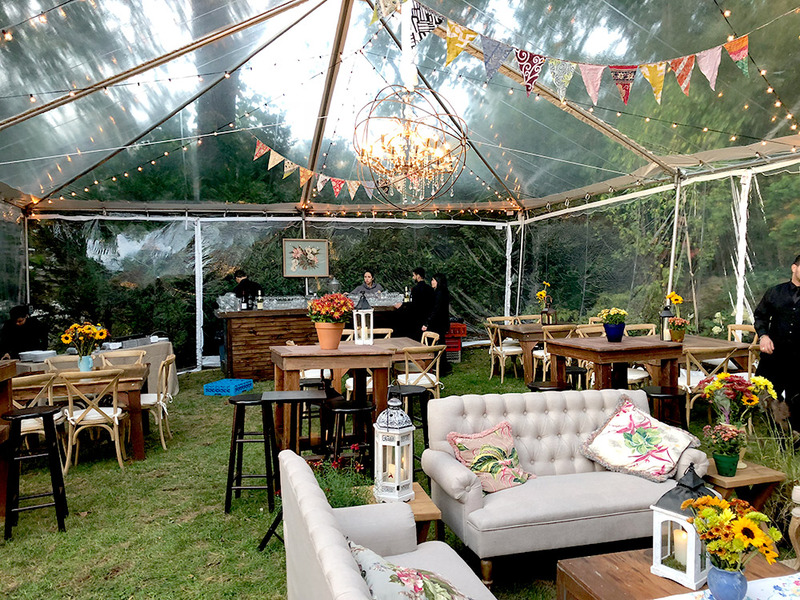 Frame tents are versatile structures that can be installed on porches, tennis courts, grassy areas, decks and practically any outdoor living space. They consist of a vinyl top stretched over a metal frame, without a center pole. 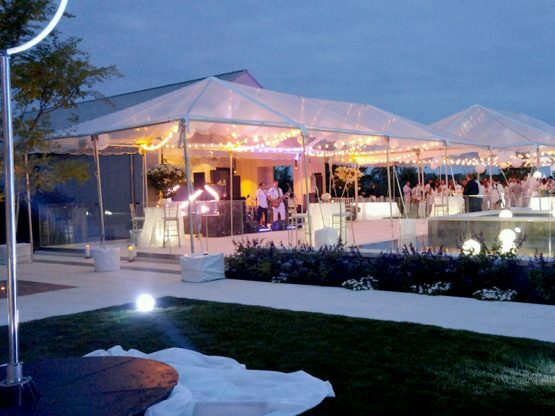 Frame tents provide a wide open area to suit all your entertainment needs. Frame tents are available in 10, 12, 14, 15, 16, 20, 25, 30 and 40 foot widths and can be expanded to any length. Walkways can be created in 4, 6, and 9 foot widths. 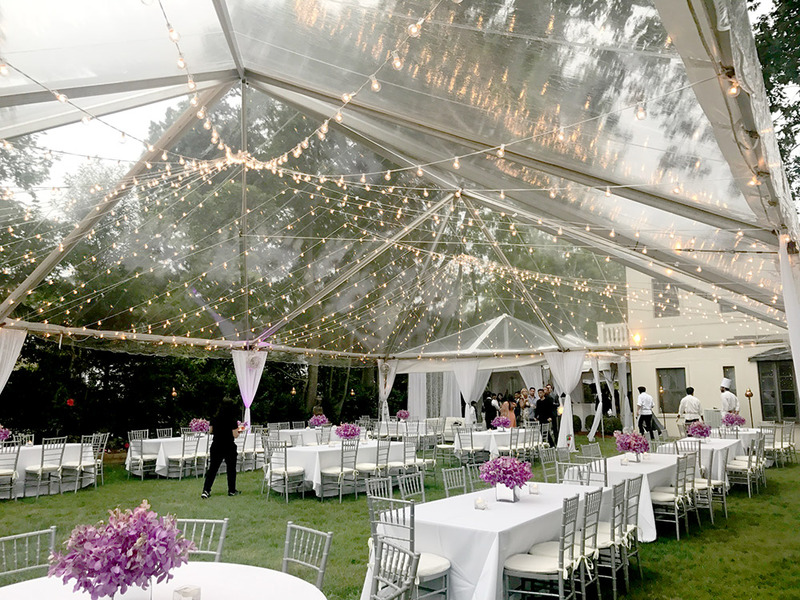 Add clear, solid, cathedral or mesh side walls to enclose the tent. Century tents are the most popular choice for your gala event with their soaring peaks and graceful swoops. These premium century pole tents will create a beautiful backdrop for your photos and enhance your event with grace, elegance and stature. Century tents are available in 40, 50, 60, and 80 widths and can be expanded to any length. Prices vary according to the location and difficulty of installation. 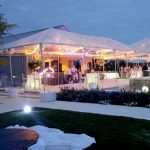 Please Call For Pricing Information Inspired by the sails of sailboats out at sea, sail cloth Tents have quickly become the choice of brides and special event planners in New York. Your guests are sure to enjoy it's nautical flair, and the sculpted peaks that create a unique open-air event space. The translucence of the fabric enhances daytime events with natural warm light, and elegantly glows when lit for evening gatherings. Sail cloth tents durable, and 100% waterproof to help assure your special event is not affected by the elements. High peak tents are individual modular tents and can be connected to create various shapes and configurations.They offer an elegant form with their smooth, graceful lines. Use our hexagon, square, rectangular, triangle or diamond shapes to build and compose your own unique and amazing environment. The design possibilities are endless. Walkways are used to keep your guests dry as they move between tents or between the house and the tent. Walkways also add a finished look to the overall presentation of your event. Walkways can serve as many different functions, such as buffet stations, a bar tents, a registration areas, a sales booths. Walkways are available in 4, 6, 9 and 10 foot widths and are expandable in 5 foot increments to virtually any length. No event is complete without the finishing touches that enhance the beauty of your environment and have your guests feel comfortable and welcome.